We do contract manufacturing for Amoxicillin and Potassium Clavulanate Injection. The assortment of our Amoxicillin and Potassium Clavulanate comprises The Dependable BID (Twie Daily), which is an anti infective in Management of Moderate to severe Infections and Systaclav (Amoxycillin + Clavulanic Acid) Tablets / Dry syrup - established antibiotics for enhanced spectrum & tolerability. The powerful & dependable fighter, Systaclav is provided as Amoxycilin 1000/500/250 mg + Clavulanic Acid 200/100/50 mg injection for intravenous use only. 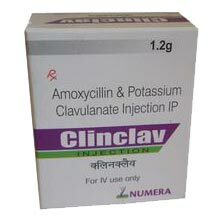 We offer several other Amoxicillin and Potassium Clavulanate Injection. Offers bacterial action to prevent supra infections.